Omega NC800HD is a 5th Generation Nutrition Center. It’s an all-around improved masticating type juicer, a few notches ahead from Omega’s 8000 series. It comes in two colors options, silver (NC800HDS) and red (NC800HDR). While most will prefer the silver model, the red finish will add vibrancy to your kitchen. All parts that come in contact with your juice are BPA-free. The feed chute is much larger and oval-shaped, unlike previous juicers that are circles measuring 1.5 inches in diameter. One thing that is unique for this juice maker machine is it has an end cap with five settings for pressure, improving the efficiency of the juice extraction for each type of produce. It quietly operates the motor at the equivalent of a two horsepower motor with 150 watts and 120 volts of power. The GE Ultem stone, mill-like auger is eight times stronger than the majority of other augers. It tears and crushes leafy greens, carrots, and nuts at a slow rate of 80 RPM reducing oxidation, resulting in the preservation of vitamins and enzymes. The included collection cups are bigger than with previous models. Plus, this juice extractor comes with a larger, heavy-duty stainless steel juicing screen. It is equipped with a built-in handle, making it easier to move around the kitchen. However, it is large and you may want to find a place to park it permanently. Highly versatile, not only does it extract juice, but it can also make homemade baby food, sorbets, spices, and nut butter. This juicer comes with a 15-year warranty. Should you have any problems, contact Omega customer support for assistance. 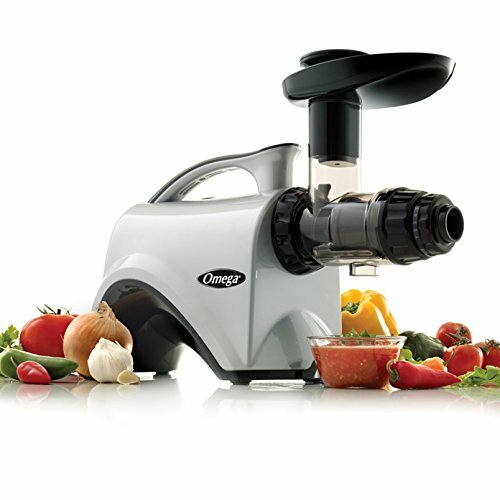 The Omega NC800HD is just as easy to set up as the previous generations of the Omega juicers. The feed chute is 2 inches by 1.5 inches, thus making it easier to fit larger pieces of produce down the tube. You still have to cut items like apples into smaller slices. Once you begin to juice, do not shove as much as you can down the chute because it might overload the machine. Slowly, push items into the juicer at a steady pace for optimal results. If you are going to juice softer fruit, you will obtain the best extraction results by alternating with a hard piece of produce. Since this juicer has settings to adjust the tension to extract a higher level of juice, you do need to learn how to use the settings—which is easier than you think. Use the settings on the end cap to adjust for a higher yield of juice. Set it on 1 for softer produce and up to 5 for harder produce. The best way to care for your slow juicer is to wash it by hand in warm, soapy water immediately after you have finished juicing. It is one of the easiest juicers to clean. The provided nylon cleaning brush effectively removes pulp from the metal juicing screen. If you prefer to wash it in the dishwasher, then you will be pleased to know that everything is top rack dishwasher safe. However, pre-clean the juicing screen with the nylon cleaning brush. You never want to leave any pulp on any of the juicer parts—especially the screen. When the pulp hardens, it builds up and becomes difficult to remove. If you ever forget to rinse and scrub it out, place the juicing screen into warm, soapy water for several minutes to soften up the pulp before attempting to clean it. Utilizing the exclusive “dual stage” mastication extraction process, this juicing machine successfully extricates juice by crushing the produce and then pushing the pulp against the juicing screen. This further separates the juice from the pulp, delivering healthy juice that is rich in the necessary nutrients, enzymes, and vitamins that our bodies need. A masticating juice extractor, like this one, will always produce a higher yield and better quality than any centrifugal juicer. Health-conscious individuals will be pleased with the variety and the enormous amounts of nutrition being delivered straight into their body. You should drink the juice as soon as you juice it to reap the full nutritional benefits. Of course, you can always juice in batches to be saved for later consumption. If you are going to do this, store your juice in a glass container that can be tightly sealed with a lid for the best results. You can store your juice for up to 72 hours when using a masticating juicer to extract your juice. Not only it can help you prepare healthy juices, it also serves additional functions to provide variety in your juicing routine—food processor, homogenizer, pasta maker, coffee grinder. It can be used as a food processor to chop your meat, fish, fruits, and vegetables into fine pieces for any meal you’re planning. This mincing/grinding ability also allows you to prepare ingredients for marinades, salsas, soups, and sauces. Additionally, it can also process soaked rice and beans producing a puree-like consistency. If you feel like eating healthy frozen desserts, feel free to freeze your juice into ice cubes then let the machine turn it into a cold healthy treat by adding milk, yogurt and other ingredients to your heart’s content. This homogenizer function can also be used to make nut butter and baby food. The complementary nozzles can be used to make pasta of varying shapes and sizes, you can choose between a round or a flat noodle; better yet you can add some flavor to your pasta to make a Korean style u-dong noodles. Nozzles with a larger opening can be used to form breadsticks. The bad news is you still have to prepare your dough. You can even grind your own coffee beans for a fresh cup of java with this machine. Some coffee beans (especially gourmet coffees) have higher oil content, this have to be dried overnight for easier processing. What Kinds of Produce Can NC800HDS and NC800HDR Juice? This juice press can process all types of produce—soft and hard produce, leafy greens, citrus fruits, beans and nuts. Hard produce include coconut, apple, fennel, watermelon, beets, asparagus, pumpkin, turmeric, celery, sweet potato, pineapple, cilantro, bitter gourd, carrots, yakon, pepper, broccoli, cauliflower, garlic, pear, cucumber and ginger. Leafy greens include moringa, peppermint, dandelion greens, beet greens, spring onion, brussels sprout, lettuce, collard greens, pine tree needles, wheatgrass, basil, romaine lettuce, spinach, parsley, kale and cabbage. Citrus fruits include lime, orange, mandarin, tangerine, grapefruit and lemon. Soft produce such as papaya, grapes, avocado, strawberry, melon, tomato, cranberries, kiwifruit, peach, mango, pomegranate and blackberry can be turned into a puree using the blank screen. You can also use this cold press juicer for making soy and almond milk. For being a multi-functional juicer, Omega NC800HDS and NC800HDR do rather well on all tasks. On some things, it does better though. For example, this electric juicer does an amazing job with extracting juice from leafy greens, vegetables, and wheatgrass, but not so well with softer berries if you try to juice them alone. The juice yield is higher with this model when compared to previous Omega horizontal, masticating juicing machines. The noise is minimal! The only sound you hear is a low hum of the motor and the crunching of your produce. Something to consider, this juicer has settings to optimize the juice yield depending on the item you place into the juicer. If you are the type of person who just likes to toss their produce in without much thought, then this may not be a good juicer for you because you will have to adjust the settings accordingly. The other thing is the price. It might be out of budget for some individuals. Check for sales and coupons that lower the cost, bringing into a more affordable price range. All things considered, the Omega NC800 Series is a highly rated, powerful masticating juicer that is one of the best masticating juicers out there on the market.